Back when I scrapbooked (my definition of "scrapbooked" was that I collected scrapbooking materials and subscribed to scrapbooking magazines. I don't actually have any scrapbooks to show for it, but I have made some for other people.) Becky Higgins (or BH in the scrapbook world) was one of my favorite designers. I've followed her blog ever since. She has great, creative ideas and cute kids! Recently, she gave away a photo shoot to a deserving family in her area. She then had the idea to arrange it so that willing photographers could give away photo shoots in their areas and she would set it up! I jumped at that chance because I LOVE giving things away! So, if you are in the Rhode Island or Southern Massachusetts area and you want to enter to win a photoshoot giveaway or you know someone who could use a free photoshoot giveaway, hop on over to Becky's Blog and comment under my post. You can nominate yourself or someone else. The details are over there! This sounds great!I often feel that I don't exist in the extensive photographic record of my family's life. And when I do finally get the camera into my hubby's hands, he doesn't take the time to set the shot up so... ecccch. I tend to resort to the left-arm-extended-self-taking-technique, which is not a good look. Would love some great shots of Jonquil and I before she gets too big to want to cuddle! Oh man, I wish I was in your area . . . well mostly because that would mean I'd be in the same area as my mom and dad . . . and secondly to win your photo shoot ;) Good luck to everyone who is entering! What a wonderful idea! Sure wish I lived in your area! Omg Keri! Yes, this is my THIRD comment on this post . . . 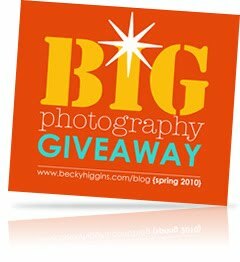 I entered my family in another one of the giveaways on Becky's blog (which I found through this post), and I won! Woot! So getting some family pics - don't have a family portrait with both of my kids in it!